Fresh from their recent debut CD launch of Sawdust & Spangles at Chelsea's 606 Club, pianist and leader Mark Edwards brought his seven piece genre bending band back home to the South Coast on Sunday. With recent Radio 2 air play on The Clare Teal programme alongside another great show, it is hoped that this collection of multi-instrumentalists will be able to bring their exotic brand of jazz to the widest possible audience. Appearing before a packed audience at The Old Market were: Mark Edwards (pno, keys) Julian Nicholas ( alt, tnr, bar, sop, bs clt, p whistle) Terry Pack (bs, bs gtr) James Osler (guitar) Dave Trigwell, (drs) Neil Corin (acc, vibes) Richard Jones (vio) Imogen Ryall (vcl) with eight piece string section and guest artist Duke Special (vcl, pno). The band draw their engaging style from many sources including circus, klezmer, dance and cinema all delivered within the broad church of jazz. Their whole live performance is both an aural and visual stimulation to the senses with background archived vintage film clips, the use of numerous additional percussion, background vocals and string section significantly enhancing the experience. From the gently opening piano strains of Mick Hutton's "Souvenir" and wordless vocals on " Yma", over a background visual of Punch and Judy, the audience seemed to know they were in for something very special, and so it proved to be. The overall sound of the band is multi-layered with accordion and guitar playing a vital part with bass and drums supporting the front line soloists. Alongside compositions from the likes of American piano giant Brad Mehldau, singer/songwriter Tom Waits and cinematic genius Ennio Morricone there were fine examples of creative writing from within the band. "I Dive Deep" by the leader and saxophonist alongside compatriot Gabi Froden was a great vehicle for the vocal talents of Imogen Ryall, full of golden toned prefect diction and a superb sense of swing with piano and violin in full support. "Baby Elephant" played over a filmed background of circus and fun fairs of the fifties contained a fine lyric composed by the vocalist on a Mark Edwards/ Julian Nicholas score with outstanding tenor and violin contributions. The strings were superb throughout, particularly during "A Rain Of Stars" once again carrying a well crafted self penned lyric delivered with depth and feeling. Things moved up tempo on the reed man's "Missus Misterfullofleas" with strong baritone from the composer and a telling accordion interlude, all performed over a gaming background from the long forgotten days of The Sinclair Spectrum. After a crowd pleasing up tempo excursion into the world of Folk Music featuring penny whistle and violin it was time for the guest artist. Nattily dressed and sporting a distinctive dreadlock hair style "Duke Special" (real name Peter Wilson) soon made the stage his own. Born in 1971 Lisbern, Northern Ireland he performs his own material in a warm, romantic yet bluesy style. Influenced by Bob Dylan and Van Morrison with eleven albums and ten singles released since 2002 he has a huge following in his own country and a growing one in the UK supported by appearances on the BBC Electric Proms' and with Jools Holland. The audience were treated to stunning songs from the Irishman including the original "How I Learned To Love The Sun", Kurt Weill's "Applejack" from the 2010 album Huckleberry Finn and the stunning "Free Wheel" which also demonstrated his hard driving piano style. The concert drew to it's close with John Williams heart rending theme to "Schindlers List", a tour de force for the strings behind soprano, violin and piano contributions, before Duke Special rejoined the band for the much demanded encore on the Rufus Wainwright classic "Dinner At Eight". It had been a stunning night by a highly talented group of musicians capable of taking this band as far and in any direction they wish. 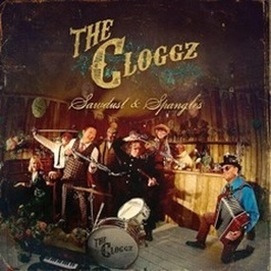 Sawdust & Spangles released on 22nd April Cloggz Music CD0001 - Click the link to order your copy now.